An island of green hills, fertile valleys, and golden beaches, Rhodes blends cosmopolitan and traditional cultures exemplified by its traditional taverns, upscale hotels, and archaeological sites. Nicknamed the "Island of Roses," this island offers visitors a chance to discover lively tourist resorts in the north and tranquil rural areas in the south. The island's slow pace seems utterly unaffected by the challenges of mass tourism--its permanent residents stubbornly clinging to their age-old traditions and relaxed lifestyle. As you explore the areas further from the busy coastline, take time to meet the garrulous locals in their natural environment, the village tavern. Lindos: Dating back to the 10th century BCE, this scenic town offers a combination of relaxing atmosphere and some of the best sightseeing in Rhodes. Rhodes Town: An architectural and cultural jewel, this former home of the Colossus of Rhodes will fascinate you with its lively streets and beaches. Faliraki: One of the most popular destinations for a Rhodes vacation, this bustling resort town boasts a cosmopolitan atmosphere and a huge selection of attractions and activities to match the taste of any visitor. Pefkos: Located just a stone’s throw away from Lindos, this small resort town combines all the modern amenities with traditional Greek hospitality. Kolimbia: One of the island’s hidden gems, this peaceful resort is the perfect destination for those looking to unwind by the sea and take excursions into nature. Kattavia: A traditional village untouched by mass tourism, Kattavia is also a popular destination with windsurfers, who catch the wind and waves along nearby beaches. 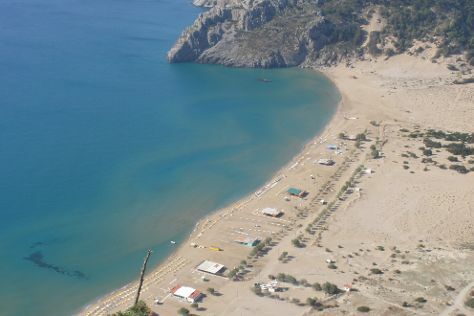 Afandou: The home of the longest beach in Rhodes, this village is one of the oldest on the island. It’s the perfect place to shop for local goods and try some homemade recipes. Ialyssos: The second-largest town in Rhodes, Ialyssos combines a selection of water activities and places to socialize together with numerous historical sites. Lardos: Boasting all the charms of an inland Rhodian village and offering easy beach access, this is a great destination for a relaxed holiday. Village of Lindos: Discover your favorite shops and tavernas while touring the winding streets between whitewashed buildings in one of the island’s most scenic villages. Acropolis of Lindos: Wherever you’re staying, a visit to this famous archeological site is well-worth adding to your Rhodes itinerary. Agios Pavlos Beach (Saint Paul): With its crystal-clear sea, this picturesque bay is not only a place of great history, but also one of the most romantic spots on the island. Medieval City: Stroll the streets of this perfectly preserved village and imagine the Knights of St. John marching through the city. Palace of Grand Master of Knights: This imposing Gothic structure is without a doubt one of the main places to visit in Rhodes. Water Park: Fill your day with fun and adventure at one of Europe’s largest water parks. Faliraki Beach: A great spot for relaxing by the sea and taking part in various water activities, the beach is right next to a waterfront packed with bars and restaurants. Anthony Quinn Bay: Next to one of the most beautiful beaches in Rhodes, this emerald lagoon provides a pretty spot for diving and snorkeling. Archaeological Museum of Rhodes (Hospital of the Knights): Explore the past of Rhodes and neighboring islands inside a building that’s a historical monument in and of itself. Lindos Beach: With amazing views, clear sea, an abundance of facilities, and a selection of nearby tavernas, this is the place to spend a day by the sea in Lindos. Numerous facilities and a huge number of attractions make Rhodes a good choice for a family vacation. Very popular with visitors from all over the world, the island might be short on those secluded nooks and crannies where you can completely distance yourself from the tourist buzz, but this means that the whole family will easily find a great selection of activities to enjoy wherever you stay. Some of the most popular places to visit in Rhodes for traveling families include Rhodes Town, Faliraki, and Lindos. These towns don’t just offer an abundance of attractions to keep the kids entertained, but they’re also great starting points for excursions to the other parts of the island. The best vacation ideas in Rhodes for a family includes making use of the island’s variety. Beaches with a selection of water sports will probably be one of your first destinations. You can continue your splashing adventure with a visit to Water Park, another place that offers activities for kids of all ages and the entire family. Younger travelers with a taste for history will have a blast taking a tour of Rhodian archeological sights and medieval castles, while those who prefer nature can go on a horseback ride at Water Park. The main advantage of many Rhodian attractions is that they appeal equally to all age groups, providing a memorable experience for the whole family. Rhodes is an island fully dedicated to welcoming all types of visitors, so traveling with family is very unlikely to pose any difficulties. Readily-available tourist amenities allow you to easily plan and adjust your Rhodes vacation to suit your family. Most towns are small enough for even young children to traverse on foot, and public transportation on the island is perfectly suitable for covering shorter distances. However, if you’re planning an extensive tour of the island, consider hiring a car. Bear in mind that some of the historical areas, especially ancient ruins, might be difficult to navigate with a stroller, so if you’re traveling with very small children it’s a good idea to have a carrier at hand. Even with the pleasant cooling breeze that’s frequent in Rhodes, there is still a risk of sunburn, so always make sure that your kids are protected. Gourmand travelers will immediately notice that, despite sharing similar recipes with the rest of Greece, Rhodian cuisine tends to use spices more generously. This reflects the influences of many different cultures, such as Ottoman, Middle Eastern, and Mediterranean and makes the well-known Greek dishes even tastier. Rhodians prefer a varied cuisine, and you’ll easily find everything from salads and vegetable dishes, to meat and seafood. For a truly authentic local taste, try some pitaroudia, the traditional Rhodian chickpea appetizer that the village of Afandou is famous for. Rhodes is also well-known for its wines, as well as melekouni, the locally made sesame dessert. Tavernas and seafood restaurants that serve traditional dishes are readily available throughout the island. Additionally, larger and busier towns such as Faliraki host a number of restaurants that serve specialties from all over the world. Going on a gastronomic journey is definitely a thing to do in Rhodes. For visitors who enjoy spending time shopping, Rhodes offers much more than just souvenir shops. As one of Greece’s most cosmopolitan islands, Rhodes will easily please the tastes of any shopper. If you’re looking for world-famous brands, Rhodes Town--with its selection of shops selling everything from fashion to electronics--is the place to go. The best and the most original souvenirs to bring back from your trip to Rhodes are the locally made traditional products, especially ceramics, jewelry, leather goods, and other handcrafted works of art. While shops selling items like these are spread throughout the island, one place where you can find a great selection of artworks is the Artistic Village Contemporary Art - Art gallery & Museum of Ceramic Art. From the very beginnings of the classical Greek period, the island of Rhodes played an important part in the history of this part of the world. Thanks to its proximity to the rich coast of Asia Minor and the position on the trading routes that connected Europe, Asia, and Africa, the Dorian city-states of the island quickly grew in wealth and influence. Conquered by the Persians in the 5th century BCE, the island was soon after liberated by Athenians and joined the Delian League. The year 408 BCE was crucial in Rhodian history because that’s when the city-states of the island united and established Rhodes Town as the mutual capital. While mostly staying off to the side during the Peloponnesian War and the subsequent events, Rhodes truly burst onto the main historical scene in the period that followed Alexander’s conquests. With the great conqueror’s successors vying for power, Rhodes thrived both as a commercial center and a hub of culture, arts, sciences, and philosophy. The island’s fortunes inspired Demetrius Poliorcetes to launch one of the biggest sieges the ancient world has ever seen in order to capture its capital. However, all Demetrius’ efforts were futile, and thanks to prompt assistance by Egyptian ruler Ptolemy I, the island was saved. As a symbol of gratitude to their savior, the Rhodians erected the famous sculpture of the god Helios in the city’s harbor. The statue was to become known as Colossus of Rhodes and it was listed among the Seven Wonders of the Ancient World. Even though the statue collapsed during an earthquake in 226 BCE, its foundations and the place where it once stood still represent one of the major Rhodes attractions. For over a century, Rhodes managed to retain its independence, but eventually the island had to accept the dominance of a new power that swept over the Greek world--Rome. Despite forfeiting its independence, the island’s economy and educational system still blossomed and attracted many influential Romans. After St. Paul took refuge from a storm in Rhodes on one of his excursions, Christianity started to spread among the islanders. With the fall of Roman power in the West, Rhodes stayed firmly within the Byzantine political and cultural sphere which is clearly visible at places like Tsambika Byzantine Museum. The Byzantine period in the history of Rhodes ended in the 14th century when the Knights of St. John took control of the island and made it their main center after losing all other possessions in the Holy Land. The Knights heavily fortified the island and introduced the distinctive tradition of western chivalry. The structures built by the Knights, like Filerimos Monastery are to this day some of the most famous tourist attractions in Rhodes. Fortifications built by the knights withstood a number of sieges, but in 1522 Rhodes finally fell under Ottoman rule and remained a part of this empire until 1912. After a brief period under Italian governorship, Rhodes was reunited with the rest of Greece at the end of World War II. The largest of the Dodecanese islands, Rhodes is renowned for its green hills and long coastline. The hills often descend all the way to the sea, creating a number of bays and lagoons. Standing at 1,215 m (3,986 ft), and crowned with the ruins of the temple of Zeus, the highest point of the island is the Attavyros Mountain. Hiking up to the top of this and several other peaks is one of the things to do in Rhodes for outdoorsy tourists. Rhodes is surrounded by a cluster of smaller islands, such as Karpathos, and visiting some of these is a great addition to any Rhodes itinerary. Just like in the rest of Greece, religious holidays play an important role in the Rhodian society. The two most important holidays, and the times when the whole island comes alive, are Easter and the Assumption of Virgin Mary (celebrated on August 15). One of the best and the busiest destinations to enjoy the local festive spirit is Rhodes Town. Another important religious festival takes place on June 29, when St. Paul’s Day is celebrated in Agios Pavlos Beach (Saint Paul). Experience the local history and one of the major tourist attractions in Rhodes during the Medieval Rhodes Festival, which takes place over several days each summer. Set in the historical surroundings of Rhodes Town, the festival brings medieval spirit back to life together with knights, damsels, jesters, jugglers, and a lively and colorful atmosphere. The island’s hot Mediterranean climate makes Rhodes a great holiday destination, with a warm season stretching from late spring to fall. The region commonly receives about 300 sunny days annually, so good weather is likely for your Rhodes vacation. However, at the peak of summer in July and August, temperatures regularly rise to the mid-30s C (mid-90s F), and it’s very important to have adequate sun protection, especially if you plan to spend a lot of time in the open. June and September tend to be a little cooler, but the sea is still warm enough for an enjoyable dip. With just a few rainy days, even the months of May and October can be a good choice for a holiday in Rhodes, more so if you’re looking to avoid big crowds. The island receives most of its yearly precipitation in December in January, but snow and frost are extremely rare. Rhodes is exposed to the well-known meltemi winds that blow in the Aegean basin, most notably between May and September. The wind usually picks up in the afternoon hours and tends to calm down later in the evening. This can cause somewhat larger waves at some of the exposed beaches, but it also attracts windsurfers from all over the world. If you enjoy this type of water activity, make sure to visit Prasonisi Beach, one of the island’s top windsurfing spots. Rhodes is a highly developed island, and getting around is pretty easy. Most villages and towns are connected by bus lines with Rhodes Town, which is the transportation hub of the island. The busses, however, can be pretty crowded at the peak of the tourist season, and the ride can be somewhat uncomfortable especially if you’re carrying luggage. Luckily, the island is also well-covered by taxi services, so choose this method of transportation to get around in a more comfortable way. If you’re planning to wander off the beaten path and explore the island by yourself, rent a car for at least a couple of days. Another popular way of getting around, especially among the locals, is by scooter or a motorbike. Rentals are widely available, and these smaller vehicles can make navigating the busy streets much easier. If you seek to be more active, use a bicycle on your trip to Rhodes. The island’s hilly terrain is generally not too challenging for relatively fit cyclists, but watch the strong headwinds along the coast, which can prove to be an obstacle. Thanks to its airport and ports, Rhodes is well-connected with the Greek mainland and the rest of Europe; keen sailors can use the island as a great starting point for an island-hopping tour.